JUST when you’ve finally picked your FAVOURITE paint colour, you’re EXCITED and ready to run to the paint store – the sun moves (well technically the earth moves, but let’s not get into those little details). Oh the glory of exposure. However, exposure is one of the most IMPORTANT parts of picking a paint colour. So not only do you need to consider the size of your room, your countertop, flooring, furnishings, and the colour of your underwear, you ALSO need to figure out how the sun (or lack thereof) can affect your paint colour. So, seeing as I’ve covered north, south and east facing rooms, I figured it only made SENSE to talk about west facing rooms as well – so here we go! In the morning hours, west facing rooms are the last ones to get those sunny rays, meaning they can look a little grayed-out and shady. 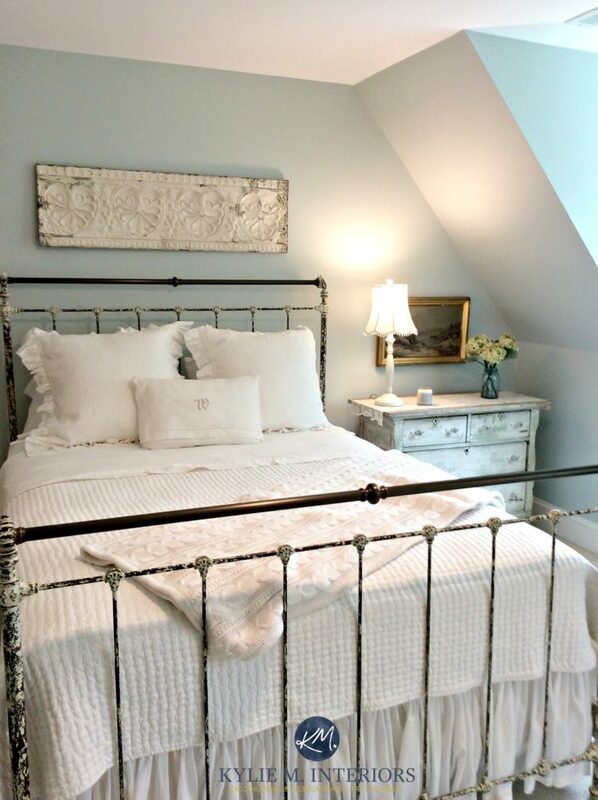 Benjamin Moore Gentle Cream – this room is south-west, the grayish wall has the morning western exposure. And remember, there is a difference between shadowed and shady. Shadowed is what you get when the sun is shining in, cutting the light and creating sharper edges. Shady is when you pour me a 6oz instead of a 9oz. Oh, and when a room is a little bit more gray toned and subdued because there isn’t a lot of light coming in. At noon, the sun is at its peak and is at its brightest/whitest. This is the light that tends to wash-out colours the most. This is when there is a bit of a light at the end of the tunnel (pun intended) for west facing rooms as those sun rays start tickling their edges. As the sun starts going down (Elton John style) it starts warming up a west facing room – adding light and a warm, bright, golden glow. This is similar to what you get in south facing rooms. This is the same wall space as the first photo. See how the afternoon light warms it up and brings it to life compared to the morning shot? The sun is at it’s most red in the late afternoon and casts the warmest light on a west-facing room. Not that your walls will be tinted pink (well in a glorious sunset they might be) but in general, it just casts a significantly warmer (think golden type of warm) light on a room. So, that covers the basics. Now you need to know what to DO with that information, so let’s get into the guts n’ the glory. If you spend most of your time in this room in the morning, you will want to pick the colour that you like the BEST in the morning light. If you spend most of your time in this room in the afternoon, you will want to pick the colour that you like the best in the afternoon light. Does this mean you completely ignore the other half of the day? No. You just don’t give it the priority. And while you may LOVE a colour in the morning light, but not the afternoon, as long as it is ‘okay’ and doesn’t look completely bugly, then it might just be a good choice – sometimes you can’t satisfy every single aspect with one magical colour. Well, then we move on to step 2. Lighting is your friend. For that time of day when your room is at it’s darkest/most shaded, use interior lighting to supplement. This can put an ENTIRELY new face on your paint colour. So, if you live in a room allll day long, then turn a few lights on in the shaded hours and see how your paint sample looks. While they say that ‘daylight’ bulbs best mimic the natural daylight, I find that they really only mimic the sunlight at it’s peak – so at its whitest. This isn’t always a ‘liveable light’ for what we’re used to with our old-school bulbs. I would opt for a warm bulb over a daylight bulb in a shaded space. So those are the basics, now let’s talk about colour. When I’ve talked about the best paint colours for north and south facing rooms, it’s been easy to peg down some good colour options as the light is a bit more predictable throughout the day. However, with west facing rooms having a Dr Jekyll and Mr Hyde complex, it isn’t so clear-cut and there IS no exact recipe. HOWEVER, there are some pretty good tips that I’ve come up with. You may want to choose colours that are warmer toned. These colours might be similar to what you’d look at if you had a north facing room. 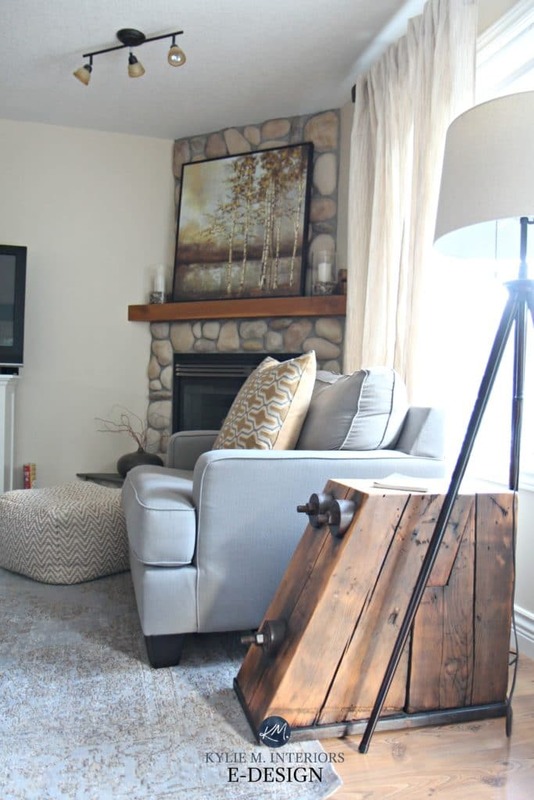 Pro: Warm paint colours can help to balance the shaded look of the room. Con: When the room DOES have the sun shinin’ it can feel considerably warmer (somewhat like an oven – not to be confused with a Dutch oven which is what I first typed out). Now I wouldn’t say that this is a CON necessarily as it depends on what your personal preferences are – if you love warm colours then you’re GOLDEN (literally). Also, if you simply don’t use this room at the ‘golden hours’ it might not be an issue for you. So in the morning hours, you might have a more shaded, muted room however in the afterrnoon, HALLELUJAH, LET THE SUN SHINE IN! That’s right – seeing as I’ve been TOLD that the sun rises in the east and sets in the west, mid-afternoon and early evening is a good time of day to be in a west facing room. You may want to use colours that a) are more cool toned (think blue/green/purple) and b) you can explore cool colours that are both a bit more colourful AND a touch more shaded (have a bit of gray in them). These colours might be similar to what you’d look at if you had a north facing room. Pro: Cool paint colours can help to balance off the warm afternoon light in a west facing room. Con: Cool colours, particularly ones with more gray in them, can fall a bit flat in the morning and the room may not feel as inviting (meaning it can look more chilly). However, if you don’t use this room at that time of day then it may not matter as much to you. And of course you can choose a warm colour, you might just want to choose a warm colour that has a bit of an earthy base, so that it doesn’t get overwhelmingly warm with those sunshiney rays coming in. Do I use my room more in the morning or the afternoon? Do I prefer warm colour options or cool colour options? Now really, the colours for west facing rooms don’t differ THAT much from east facing rooms. The quality of light in an east facing room in the afternoon is similar to that of the west facing room in the morning. They both have a subdued, grayed-out look that is maybe a bit flat looking. However, while they each get a good dose of sunshine for a chunk of the day, the eastern morning light is bright and soft but not overly HOT, while the western afternoon light is bright and hotsy totsy – particularly as the afternoon moves along. That warm light streaming in can really jack up a warm paint colour, enhancing it even more while cool colours can add a touch of balance to the warm rays. So, you can certainly check out the paint colour options for an east facing room as many of them could work and you can ALSO explore these! Classic Ivory is a nice warm creamy yellow with a subtle neutral base. It will come to LIFE in the afternoon and help to balance off the more muted morning/gray light. Light Khaki is a light/medium that is a mix of a creamy beige with a warm green undertone. Ylang Ylang is creamy yellow like Classic Ivory but with a bit more freshness as it’s a tone lighter. Lemongrass is a beautiful green tone with a warm slant and an earthy base. Macadamia is a fabulous beige tone with a mix of warm undertone that center around orange, but can flex into a bit of yellow as well. This will of course be brought out in the afternoon light! It could fall a touch flat in the morning, just because it does have a bit more of a neutral base, but interior lighting can go a LONG way to lifting it up! Brick Paver is a beautiful vibrant brick tone with it’s orange base. I also closely considered Fired Brick which has some more red mixed in and is darker. Both colours would be striking, but slightly more subdued in the morning and would positively DANCE in the afternoon! West facing rooms that are used the most in the afternoon. The cool colour will help to balance off some of those warm rays. Just pay attention to blue tones as some of them can mix with the warm (yellowish) rays coming in and cast a vague green tint on the walls! West facing rooms that also have south facing windows. These rooms will be CONSIDERABLY warmer in the morning, rather than more gray and flat and will also be just as warm in the afternoon! Morning Fog is a nice light/medium gray with a decent cool purple undertone. Austere Gray is a more neutral green as it has a decent soft gray backdrop so it’s not TOO icy/cold, but it’s definitely not a warm green. Woodlawn Blue is touch and go as it might fall a bit cool in the morning. Woodlawn is a blue with a gray undertone that CAN pick up a touch of green. It will be soft and pretty in the afternoon to off-set the warmer rays coming in. Fernwood Green is a super cool lighter green (with a touch of warmth) and a nice life to it. Not too colourful, but it’s definitely resting on it’s slightly neutral base. Rainwashed is a lighter blend of blue, green and gray. The green and blue are stronger than the gray, but will fall back a bit in the morning and work in the afternoon to combat that warmer light. Misted Green is a beautiful blend of gray, blue and green. It has enough colour to show up in the early morning gray light and will rise up and balance off some of those warm rays in the afternoon. It’s a STUNNER. Abso-tootly! However, keep in mind that the more neutral it is (the less ‘colour’ it has in it and the more beige/gray it looks) the more flat and drab it might feel at the ‘shaded’ time of day. Look for neutrals that have atleast a wee nugget of colour in them to off-set those shadows a bit! You’ll also want to make sure that your interior lighting is sufficient to help colours come to life. Benjamin Moore Indian White is a soft, creamy neutral with a subtle beige base so that it isn’t overly yellow. Stonington Gray is a lovely cool gray with a very slightly stormy blue undertone. And while it will lie more flat in the morning, it will provide some nice balance in the afternoon light. It could maybe pick up a tiny wink of green when the blue undertone hits the yellow sunrays, but it would be subtle. Sandy White is a lighter creamy beige tone with a really neat, vague green undertone that adds interest if you’re looking for something a bit beyond beige. Monroe Bisque is a pretty standard ‘beige’ with a warm yellow undertone that can help with the muted morning light without going OVERLY warm in the afternoon. Knitting Needles is a nice cool gray with a vague stormy purple undertone. Again, cool in the morning, but still ‘pretty’ and will offer some balance to the warm afternoon sun. Wool Skein is like Sandy White in that it has a vague green undertone (much more subtle than Sandy White though) with a soft beige backdrop. Do you have a west-east, southwest or northwest facing room? Like I’ve mentioned, it’s not just your exposure that you have to consider (indecent or otherwise), there’s MANY more things to consider when picking the best paint colour. If this info doesn’t get you well on your way, check out my e-design, it’s affordable AND fun! 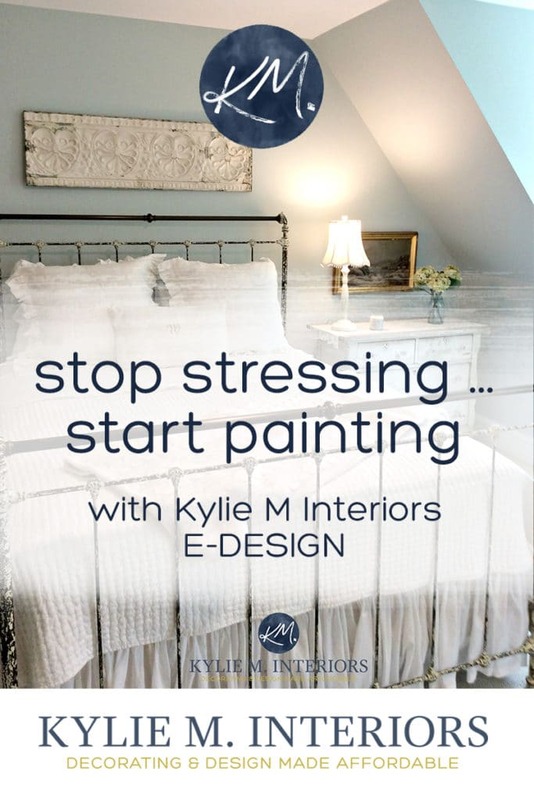 Kylie M Interiors E-design, Virtual and Online Colour Consulting Based in Nanaimo BC on Vancouver Island Blog, Consulting and More! Oh, mine is a saga about my (north) west facing Master bedroom…a room you want to look good morning and night, and if you are me who works at home and moves through the room during the day, you want it to look good then too! We painted it at one time Malted Milk by Behr or Sherwin Williams and the color was so beautiful in a room at my mom’s but I hated it immediately. It looked too antique-y yellow-ish cream for my tastes (I swear it was just a nice warm creamyat my mom’s!). It stayed too long and I agree, was hot hot hot in the afternoon! Then, I chose BM Wedgewood Gray. I have to say that color did the west facing feature justice (and could be on your list I think), but I realized immediately I’m not a blue person (except for more arts and craft type blues…or maybe navy). Anyway, I went back and bought Gray Owl as a sample, and yes, it was too cool. I tried everything!! And somewhere along the line ended up with Repose Gray (SW). I must have looked at my sample a lot during the day b/c I love the taupe-ish undertone it gets during the day. (And yes…I poured over and over your blog and your various pictures of different paint at different times.) The problem I have is that in the morning it’s too cool for my taste, it gets almost a black-ish brown undertone at night and a cool green undertone when the lights are out during the day and it isn’t midday. I think I went too intellectual to be honest…thought Repose Gray was a “cool” color…it’s on all the blogs! Lol!! Anyway, I’m trying to decorate around it with colors that work with Repose Gray but warm it up. Again, I sure wish I had read this sooner and picked from your colors, or could just hire you to choose!! Next time I promise!! I admit, Kylie, I would love to hire you to choose, but I get very controlling about these choices and I’m worried that if I hire someone, I’ll feel forced to choose something I don’t want. Maybe in a future blog post you could show us pictures of a consult and what you did to help the person. I do think I am enticed by the idea of a color consultation, but a bit intimidated, too. Maybe others feel this way, too. Hi Tanya, I totally get it. One of the cool things that I say to clients is that I’m just giving them suggestions, they are actually CHOOSING the colour. I always give 3 (and sometimes 4-5) suggestions and I explain how they might work. From there, you get to choose which one is your fave. I think it’s far more empowering and can give you that sense of pride, knowing that you chose it. There are thousands upon thousands of paint colours out there, my job is to show you some that suit your room and tie those into your personal preferences, and you get to take it from there! And you are right, I should show an ‘actual colour consult’ as I send it, it’s pretty cool and I hope you decide to give it a try some day! Hi Kylie. I really find your posts informative and have been thinking about our colours. I am torn about the beautiful solid oak wood throughout my home. I have large vaulted rooms and expansive windows from north to west, so options are limitless.. I am trying to decide if I should paint my solid oak raised panel doors white or darken them with dark brown stain/paint? Currently they are medium brown and wood floors are honey oak. This will then drive the colour of my walls. What do u suggest? Hi Jody! With Lenox Tan, I might lean the most toward Cloud White which has a bit more warmth than White Dove, but isn’t quite as clean/bright as Simply White…hope that helps! Hey Kylie. I will be painting my kitchen cabinets Simply White instead of Alabaster. I am wanting to paint this room which have windows on the west side which gets more afternoon light. I would like a gray with no pink or purple undertone. I will be painting. My living room which is pretty much open except for one small petition. My living room gets morning light and has a window facing east. Do you have an opinion on a gray. I really would like to lighten these 2 rooms. What about when you have a room that has windows on the West, South, and East? East and west facing combined room with more light in the west\afternoon (dining and small galley kitchen side. Agreeable grey, you’ve got me so hooked on the idea of this color to replace our current we latte (I also commented on another entry over this), would agreeable grey fall short or become washed out or muddy? I think I’ve read every post on paint brsides north\south. Facing rooms as we don’t have a single one of those (boooo). I completely admire amd am thankful for your blog and your videos! Thank you! What yellow neutral goes well with Wet Concrete? Hi Do you mean misted Green (Benjamin Moore 2138-50) or misted Fern (CC-668 / 482)? Oops, I mean Misted Green, thank you for catching that! It’s been fixed! Hi! I’m waiting to see if you will post reply for a comment I submitted 1 week ago. Regarding your thoughts on sw white heron for wall color and Zurich white for trim? We are building a home and I picked this out with our designer. 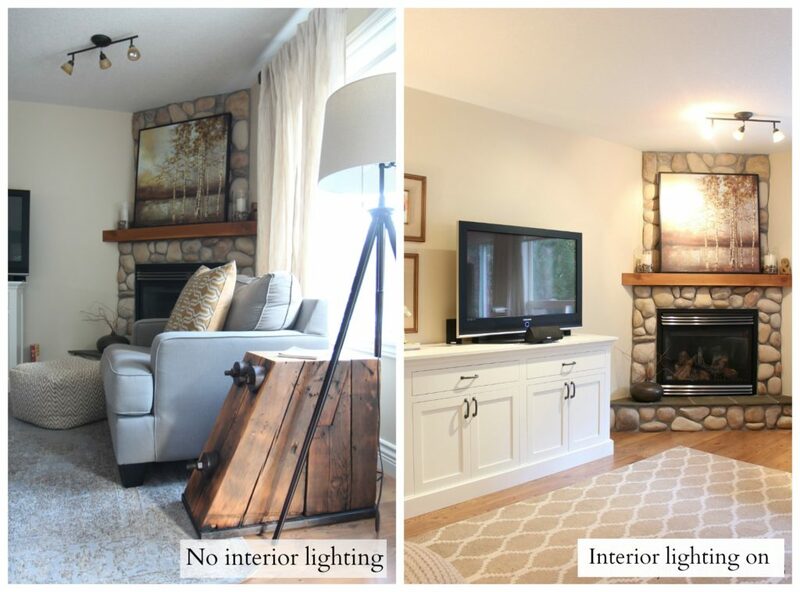 You seem to be an expert on lighting and I’ve been reading your blog for so long and wanted to get you insight on color. Have used it, ect? Please see the previous email – it was more detailed. I have been seriously pouring over all your articles and links for nearly 3 days, trying to find the specific LRV range (i.e. between 50 – 60?) for a west facing bedroom. There are 3 small dormer windows in this room (which are darling!) but they do not contribute much in the way of any natural light pouring in. And although I’m well past the age of “I probably should know this by now”…….I’m clueless. ( Better late than never to the game right?) I’m looking for a neutral beige or greige or a subdued blue color (bleige?) for a fresh and clam “ahhh” feeling for my overnight guests. Right now it’s a deep brown-pink-purple color which looks like doo-doo. If you could suggest an LRV range it would be a good jumping off point to narrow things down a bit. If it helps, I currently bought the Pottery Barn Jacquard duvet in neutral. That alone will tell you that I don’t venture too far outside the lines! BTW: I’m bummed you are no longer taking on clients due to your busy schedule. Bad for me …. but great for you!! Keep up the good fight for those of us who are color challenged! Hello. We have a west-facing living room and kitchen and are going to paint our oak trim. Would you recommend BM White Dove or SW Pure White for the trim? Will likely do a greige or a light color for the walls. Thank you. Hi Shana! The trim colour can depend SOOO much on the backsplash/countertop as Pure White is almost ‘white’ and White Dove is warmer/softer. If you have clean whites in your backsplash/countertop you might choose Pure White. If you have soft warm whites/creams, you might find White Dove to be a better fit.